In stock -This product will ship today if ordered within the next 10 hours and 11 minutes. Doisy and Dam’s goji & orange bar is vegan chocolate for those who like the sweet life. The delicious, chewy texture of the goji berries is paired perfectly with the natural and sweet orange flavour, creating a healthy chocolate bar to satisfy those sweet tooth cravings. All ingredients certified organic unless marked with an asterisk. 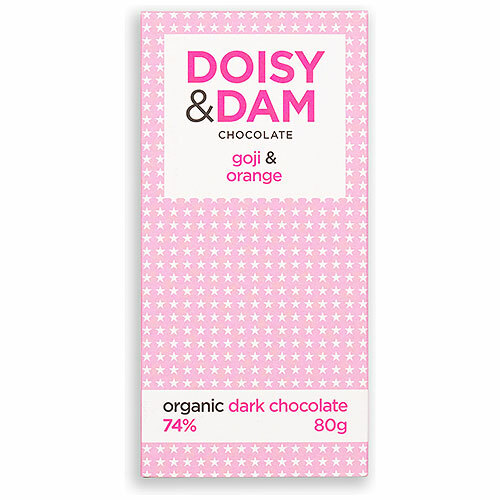 Below are reviews of Doisy & Dam Goji Organic Dark Chocolate - 80g Bar by bodykind customers. If you have tried this product we'd love to hear what you think so please leave a review. 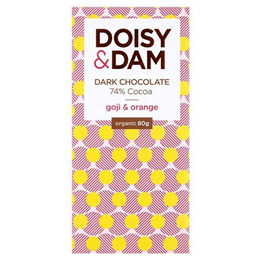 Doisy and Dam’s goji & orange bar is vegan chocolate for those who like the sweet life.